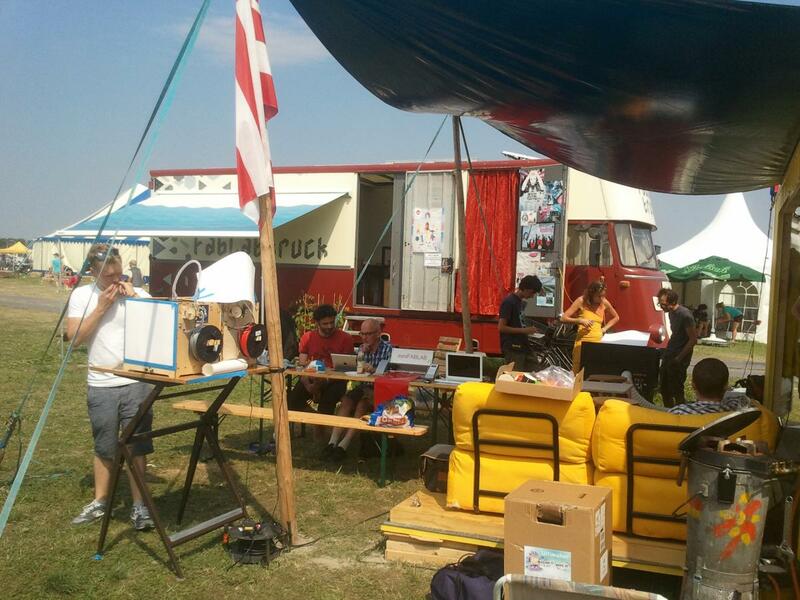 Mobile Fab Lab for Festivals, workshops and schools. The Fab Lab Truck brings digital fabrication to your doorstep. Our truck contains a laser cutter, 3D printers, a vinyl cutter, a small CNC and an electronics lab. We provide Fab Lab workshops on any location. Our goal is to get people acquinted with the Fab Lab concept and to show what you can make with these machines. We do this by giving hands-on workshops in the Fab Lab. Our mobile Fab Lab can run independently in the truck. It is also possible to set up a temporary Lab in a school or on a festival. The Fab Lab truck exists since 2010. We are an independent non-profit foundation. Our mobile Fab Lab is for rent for schools, festivals and companies. The Fab Lab concept has been started by Neil Gershenfeld, director of the Centre of Bits and Atoms (CBA) at the Massachusetts Institute of Technology (MIT). He realised that given a few simple machines, it is possible to make almost anything. With that thought he introduced a workshop called "How to make almost anything". This was the basis for the Fab Lab. A Fab Lab is a workspace furnished with computer controlled tools. These tools can be used to create simple prototypes are one-offs of a product. The tools one usually finds in a Fab Lab are a laser cutter, 3D printers, CNC machines and vinyl cutters. The last few years, these machines have become much more user-friendly, while at the same time the price of the machines went down. With that, accessiblity to these production tools has become much wider. At the same time, internet makes it easier to share designs. Alternative copyright rules make sharing possible. The Fab Labs promote Open Design. The Fab Lab Truck is an initiative by Moving Concepts Foundation.